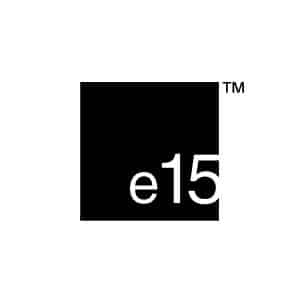 e15 stands for consistent, progressive design coupled with high-grade materials and innovative, handcrafted production methods. As a quality modern brand that caters to a global home and contract market, e15 maintains a comprehensive approach to interiors, offering a distinct collection that is compatible with diverse environments. With a strong foundation in architecture and design, e15 is defined by the unique backgrounds of its co-founder and architect Philipp Mainzer together with designer and art director Farah Ebrahimi. In close cooperation with a coterie of designers, architects and artists, e15 develops original products and supports artistic statements, which reflect the brand’s philosophy and its open approach to diverse cultures and disciplines. Named after the postal code of its first workshop in London, the company was founded in 1995. A radical, new simplicity marked the debut of the collection, leaving an indelible mark for the company and the history of modern design. With essential forms, baring all natural markings and characteristics as visible in design classics such as the table BIGFOOT™ and the stool BACKENZAHN™, e15 has established a leading reputation for the pioneering use of solid wood in its purest form. With headquarters based in Frankfurt, e15 holds a worldwide retailer network with over 600 partners as well as flagship showrooms in Frankfurt and Milan. 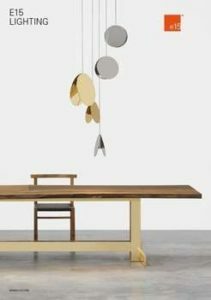 In addition to the collection of furniture, lighting and accessories, e15 collaborates with PHILIPP MAINZER OFFICE FOR ARCHITECTURE AND DESIGN to provide architectural and interior design services, realising projects on an international scale. Since 1995 e15 has been manufacturing furniture in the upper segment of the market with modern und timeless design, specially selected materials and highest manufacturing quality being the most important characteristics of the brand. For e15, the focus lies on longevity of the products which the company ensures by using traditional manufacturing methods in specialised workshops. 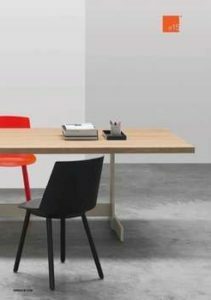 The company’s most important principles are the production of long-lasting, timeless and high-quality design furniture made from sustainably produced high quality materials. The company politics consciously focuses on the principles of sustainability and a sensible environmental protection. The production cycle of e15 furniture, from the design to the delivery of the product to the customer is carried out in line with environmentally relevant laws and standards. Further, e15 supports and calls for a strong environmental awareness from its employees. At e15 all products are developed with the goal to create long-lasting, quality and timeless designs. An understated design is meant to generate an enduring approval. 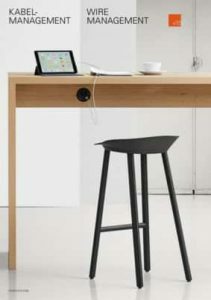 All materials used by e15 for its furniture are recyclable. Sustainability, human and environmental tolerance as well as degradability are all decisive factors for the choice of materials used for e15 furniture (wood, MDF, plywood, foam, leather, fabric, steel, high grade metals and glass). 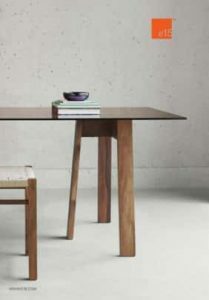 For e15’s solid wood furniture only PEFC certified European oak and walnut wood from sustainable forestry is used. 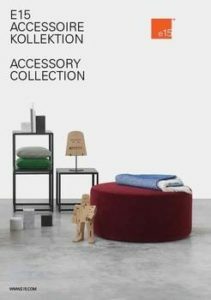 The in e15 furniture utilised fabrics and leather are obtained from selected suppliers, who can verify a sustainable and environmentally friendly production. For the production of e15 furniture centuries-old craft knowledge and expertise is used, supported and sustained. The production of the individually made pieces takes place in Germany and Austria. 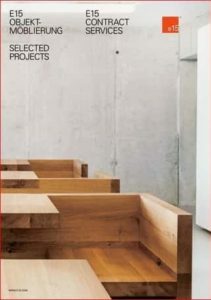 For the extensive e15 furniture collection e15 works with specialised workshops. For the production of its furniture, e15 places great importance on energy efficient machines and the use of sustainable energy sources. Here basic EU rules of air and water filtering and cleaning are obeyed by and the use and emission of poisonous chemicals is avoided. For the treatment of all furniture surfaces, e15 uses natural and environmentally friendly agents, which do not contain any poisonous gases or ingredients but are tolerable for humans and the environment. We are open for business! Come visit the e15 fair stand at Salone del Mobile.Milano in hall 16 / E44. NEED MORE E15 INFORMATION ?